Queen Mytha was obsessed with getting the attention of the King, which led to her ingesting every known poison she could. Mytha was the fairest queen in the land. She was wed to the Prince of “that nearby castle” and became a Princess, eventually this Prince would go on to become King, and she his Queen. What castle Gilligan is referring to is very likely the Iron Keep, as it is the next area after conquering Earthen Peak. We know that Mytha is familiar with and can utilize the now lost art of puppetry (creating manikins to serve her will). This art belonged to the Kingdoms of Venn and Alken. We also know that the Iron Keep was built upon the land of Venn after the unknown Lord who was to become the Old Iron King, wrested it away. This places Mytha within the time of, or a similar time to the Kingdoms of Alken and Venn (“long ago, when this land was called something else…” as Gilligan describes it). We also know that the Prince of Alken and the Princess of Venn had a forbidden love for each other. It would therefore seem likely that Mytha married the Prince of Alken. The story of the Prince of Alken (see Bell Keeper’s set) and the Princess of Venn seems to tie in very well with that of Mytha, but unfortunately does not seem to make sense. The position of Alken (perhaps around the Lost Bastille/Heide area), does not make sense as a “nearby” castle. We know that Venn was in the same position as the Iron Keep, so Mytha marrying a Prince from Venn seems more likely. Alternatively, it is implied that the Old Iron King built the castle during his reign (with the Iron he made from the Scorching Sceptre) and since it was built during the Old Iron King’s reign, Mytha could not have been “wed to a Prince of that nearby castle” if it was prior to the castle being built. This therefore places her within the time of the Old Iron King. Something that might explain this is that Belfry Sol was said to be built by the Princess of Venn. If that was in place prior to the Old Iron King conquering the area, then it seems likely the Old Iron King built his castle around or atop the already existing castle. We are also told (through the guide book, which is, admittedly, unreliable at times) that Harvest Valley was mined by the Old Iron King’s men (most probably for iron). This indicates that Mytha came after this time period, because as we know through experience, the valley is now filled with poison and would therefore not be conducive to being mined for iron, even if we do find now-hollowed workers there. All of this evidence is problematic because we do not know of the Old Iron King having any heirs, and it would seem that his reign and that of his kingdom dramatically ended when he was consumed and his castle subsumed by lava (“icherous earth”). It may be that Alken existed where Heide and the Lost Bastille do now. After arriving in Heide from Majula, If we look towards the distance (especially on the right hand side), we can see a series of now subsumed buildings that clearly resemble the dominant architecture of the Lost Bastille, tying the two areas together (though obviously not conclusively proving they are one and the same kingdom). This is important, because we are told that the Lost Bastille exists where Alken once stood. When approaching the Blue Cathedral, there is a detailed and beautiful mosaic on the ground, with some floral arrangements. This exact mosaic can be found on the ceiling of Mytha’s boss chamber. 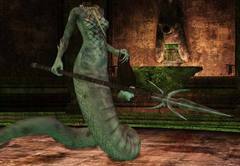 Mytha herself uses magic based attacks, and the weapons of the Heide Knights do magic damage. With these connections, it is probable (however unlikely) that Heide’s true name at one point in history, was Alken, and that this area we examine is its remnants. There are also interesting thematic connections between Heide and the Iron Keep. Both were subsumed, however one in blue (the sea) and one in red (lava or icherous earth). We see similar architectures (especially the circular patterned windows) in Heide as we do in the Iron Keep, as well as similar enemies (in the form of the Old Knights in Brume Tower). These two kingdoms were said to rival each other despite being founded by the same man. Heide is home to the Blue Sentinels and the origin of the Way of Blue, a system devoted to helping and protecting others. The Iron Keep, which constructed the Undead Purgatory under the Old Iron King’s rule is home to the Brotherhood of Blood, a collective only interested in the shedding of (red) blood. These two factions uphold an intense rivalry, and hate each other (similar to Alken and Venn). Belfry Luna, said to be constructed by the Prince of Alken resides under a blue moon, while Belfry Sol said to be constructed by the Princess of Venn, resides under a blazing red sky. While these connections may be clear, it is difficult to draw any definite conclusions. With regards to Mytha, it may be that she did become a Princess then Queen of Alken, but her kingdom was later subsumed by the sea, though this is unlikely because her connections to the Iron Keep are stronger. It is difficult to reconcile this narrative. At this stage it seems most likely that Mytha was married to a Prince of Venn (that we know nothing about) and become a part of that Kingdom. If this was the case, then that may explain why she has been beheaded. It would be likely that as Queen of Venn during the Old Iron King’s takeover, she would be beheaded to confirm Venn’s defeat. After this beheading it may be that the poison somehow revived her. Alternatively, she may have been beheaded because she had become a monster, and like Theseus killing Medusa, monsters are often the targets of brave warriors. Mytha was considered very beautiful, and she knew this. But when she was married, she realised that her husband, the King, did not love her. He had feelings for another. Mytha could not believe, and would not accept that someone as beautiful as her, could not be loved by this man. That there was something higher than physical attraction impelling someone to love. Instead of questioning why it was that her King did not love her, why he loved another, she sought further beauty at whatever cost. In ancient times, cosmetics were a much simpler affair. Lead was a common property in Roman cosmetics. Cinnabar and red lead were used as rouge despite the generally widespread knowledge that they were poisonous. Malachite was used as green eye shadow, and this too was poisonous. 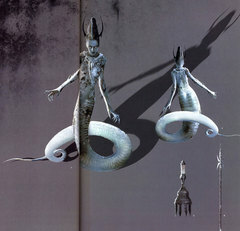 These ideas may have provided the inspiration for Mytha’s character. Mytha became obsessed with regaining (or gaining) her King’s love through beauty and by being the most beautiful. She sought any means to achieve this, even poisoning herself (likely through make-up, or simply ingesting poison). It may be that this is where the man who would become the Covetous Demon played his role. As she poisoned herself, his love for her may have developed and grown. Instead of reciprocating this love, Mytha may have taken it as inspiration to continue to poison herself. Hopelessly devoted to her, the man would eventually become the Covetous Demon, never leaving the Queen’s side. Mytha seems to have been driven to greater and greater lengths to try and make her husband fall in love with her, but it did not work. He did not love her, and perhaps even looked at her with disgust. This caused Mytha’s drive to become twisted with ire. Just as the man who loved her became the Covetous Demon through desire, Mytha underwent her own transformation. She became a snake like creature (animals associated with greed and desire in the game and their poison and bite in reality). What happened next is unclear, it may be that at this stage, her husband saw what a monster she had become and had her beheaded. Or, she may have poisoned her husband and been beheaded for her regicide. Alternatively, as suggested above, she may have been beheaded in the coup of Venn along with her husband. We do not know how the story eventually played out, but Mytha somehow became the sole Queen of a lost kingdom without her King. Despite being beheaded, Mytha endured. Perhaps it was the poison that filled her body that allowed her to carry on. Mytha had become disillusioned with winning her husband’s love, but determined to win the love of everybody else in a vain attempt to prove that she was indeed lovely. She still did not understand the very nature of love, and sought satisfaction purely in physical attraction. Her home became the Earthern Peak. A place that may have once been built to process the minerals mined from Harvest Valley, but now became a source of endless poison. 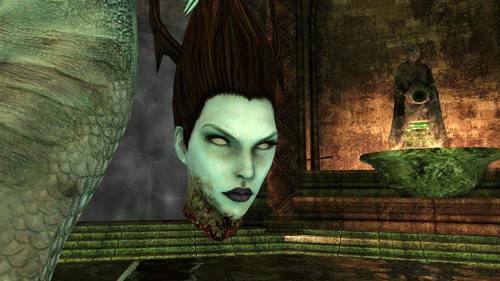 It may be that Mytha managed to seduce or attract the Grave Wardens of the Undead Crypt, who became her servants. Sorceresses from the land of Jugo took up residence with her and perpetuated her desire to draw others in through seduction. Without a genuine following from her people (which she would have had at one stage), Mytha utilized the art of puppetry from Alken and Venn to create servants and subjects for herself. She breathed life into manikins so that she would have slaves to serve her temperamental will. Despite her strong desire to be loved that had seemingly overcome her actual perception of herself, in some way Mytha recognized that she had become a monster. Despite giving the manikins life, she tore off their faces. Though they were but puppets, she could not forgive them for gazing upon her. This clearly shows that she was disgusted with her appearance, even after the lengths she had gone to, to attain beauty. Despite the end result, we can see the misguided means by which Mytha achieved her current form. Her story is incredibly tragic.